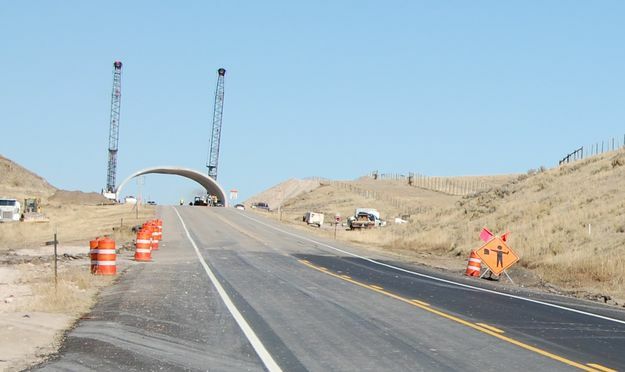 The Wyoming Department of Transportation Pinedale construction crews will be setting the overpass arches the week of June 11, 2012 as part of their wildlife connectivity project. Photo credit: Wyoming Department of Transportation. This overpass two miles north of Daniel Junction on US 191 was set last year and is one of two overpasses that will be part of the project. Traffic will be delayed on US route 191 at milepost 105, near Cora Junction, due to overpass construction. The delays will begin June 11 and will continue daily between the hours of 8 a.m. and 6:30 p.m. Traffic will slow and halt for up to twenty minutes at a time, so drivers should take note and leave early to accommodate delays. The work should take about ten working days to complete. WYDOT would like to remind drivers to slow down in work zones, be alert and cautious of roadside workers. The Trapper’s Point Wildlife Connectivity Project was awarded to Reiman Corporation and consists of 29.7 miles of 8 foot high deer fence, six 70 foot bridges and two 150 foot wide animal overpasses. One overpass is located close to Trappers Point, near the junction with WYO 352 (Cora Road). The other overpass is nearing completion and is located about two miles north of Daniel Junction at what’s referred to locally as Boroff Hill. It is estimated that each spring and fall approximately 2000 pronghorn and 3500 mule deer pass through the area and would use the overpasses and underpasses. The project has received awards and recognition from the Exemplary Human Environment Initiatives (EHEI) and the Exemplary Ecosystem Initiatives (EEI). The Trappers Point area is well-documented as a major wildlife migration route, but increasing traffic on US 189/US 191, along with ongoing development in the region, have served to disrupt migration. The project will serve to reverse this trend and help restore diversity, health, and genetic vitality of the various big game species. For further questions on this project, please contact Wyoming Department of Transportation offices in Pinedale at 307-367-4488. For more information on closures, delays and construction, go to www.wyoroad.info.